Sync automatically to any device. Take the Toodledo Productivity System with you, wherever you go. Toodledo automatically syncs your account to everywhere that you need it. 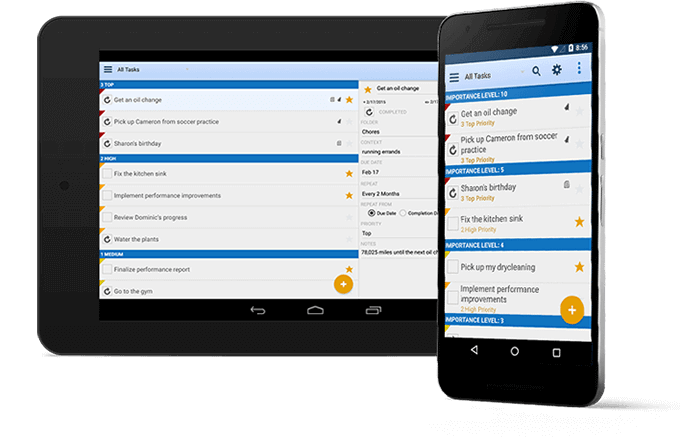 Access the entire Toodledo Productivity System on your Android phone or tablet. Our native Android app automatically syncs to ensures that your stuff is ready anywhere that you need it. Unlock the full power of Toodledo in any web browser at any screen size. Toodledo.com will sync seamlessly with our mobile apps, so your data will be available wherever you need it. We have plugins for Chrome, Firefox, Safari and Internet Explorer that allow you to record tasks as you browse the web. Toodledo plays nicely with over 100 third party apps! Our open API allows developers to continue to extend Toodledo in unique and interesting ways. There are many ways for you to integrate Toodledo into your existing workflow and be more productive. Add tasks via email, automate actions with IFTTT and even sync with your calendar.